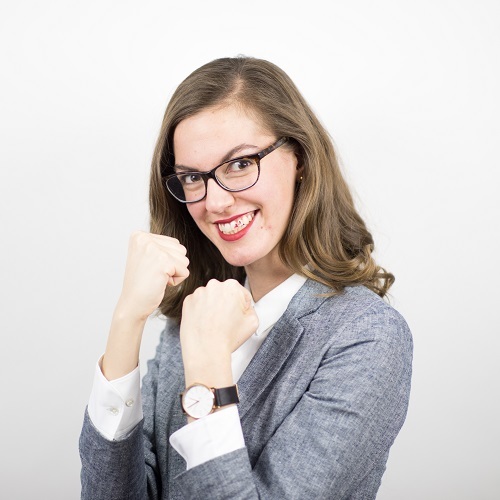 How to be FEARLESS (With Roxy Roberts) — by Binocular Theatre — is a play about a firecracker of a motivation speaker and the self-defense course she creates in response to being harassed and threatened with physical violence. Currently showing at Bell Tower Coffee, this sure-fire Toronto Fringe favourite blends consistently sharp comedy, incisive drama, and a performance from Ali Joy Richardson (in the title role) that accepts nothing less than going for the fences. Richardson fills Roxy with the boundless, earnest enthusiasm of someone who has gained momentum after rebuilding from trauma. This makes her deeply empathetic, because she is happy to simply be alive. As humans we all crave this but know how hard it can be to summon at will. Directors Neil Silcox and Courtenay Stevens are precision engineers, strategically pacing out Richardson’s consistently moving script, which leaves no mundane detail unturned if it offers the opportunity for a dose of laughter or pathos. The numerous chuckles Richardson gets from sitting on a chair or clumsily hitting herself in the face shows a performer in absolute command of both stage and intention. Richardson’s acknowledgement of the audience, of the fact that the people in front of her aren’t faceless ticket holders but are alive and full of feelings, is what pushes the play over the top. Roxy’s investment in our personal safety as her students means that she addresses us directly, which makes us participants in an experience that cannot be duplicated without our presence. How to be FEARLESS (With Roxy Roberts) is too thorough in the mileage it gets out of its educational premise to be overlooked. It’s an epic battle between the anxiety of being responsible for our safety, and the optimism it takes to stop worrying that some things are out of our control. The only catch being that we are fighting on both sides. Content Warnings: Audience participation; Unconventional venue. Photo of Ali Joy Richardson by Neil Silcox.